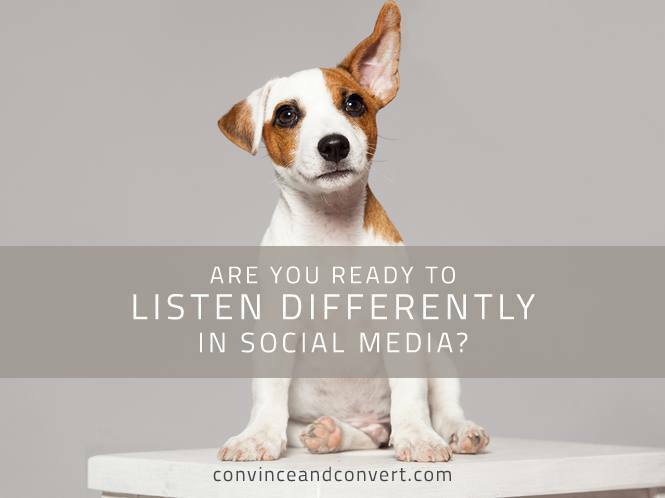 Are You Ready to Listen Differently in Social Media? My new book is called Hug Your Haters: How to Embrace Complaints and Keep Your Customers (amazing bonuses worth thousands of dollars if you order here). Put simply, the Hug Your Haters formula is to answer every complaint, in every channel, every time. This is in sharp contrast to what most companies do, which is to answer some complaints, some of the time, in the channels the companies prefer. But more and more companies are embracing the opportunity that customer interactions – especially in social media – present. When you answer customers right away in social, in can blow their minds and win their hearts. One of the obstacles faced by companies that are trying to be more responsive in social and treat it like a first-tier customer support channel is that customers don’t always make their needs obviously known. If someone calls, the phone rings. If they email, it shows up in the inbox. But if they tweet or leave a Facebook comment, will you even see it? Online customer service software company Conversocial partnered with New York University on research that found that more than one-third of all tweets to companies were about customer service issues, but that only three percent incorporated the company‘s Twitter username with the @ symbol. They are tweeting ABOUT you, but not AT you. This is even true with social posts when location services are turned on. Geofeedia research found that 74% of location-tagged posts don’t include a keyword or hashtag. So how are you supposed to find those customers and answer them? Just from a customer service perspective, this has huge potential to blow their minds and win their hearts. Imagine you’re at a store in the mall this holiday season, and you post a photo of a sweater to Twitter. You don’t mention the brand or the store, but you have location services enabled, and the mall location is tagged on the tweet. Using location-based social listening, the brand could find that tweet and execute a surprise and delight campaign that would create kinship, loyalty, and possibly some free reach and awareness. There’s also a real opportunity here to eavesdrop on customers and prospects and learn more about what they really think about your brand, your products, and your services. When they are sending message AT you they may temper their comments accordingly. But when they are talking ABOUT you and presume that you will not find their comments, they may be more candid and open about their beliefs. Geofeedia has an example that I’ve used in a few presentations where a guy at the Mall of America went to the Cheesecake Factory and tweeted “They’re talking about an hour and a half wait. Crazy!” He didn’t tag the brand. It was only findable because he had location-tagged the Mall. That’s a customer experience issue for Cheesecake Factory that under ordinary circumstances would have been invisible. Not much has changed in social listening in several years, really. The typical software has gotten better from an interface standpoint, and the data can be sorted in more ways, and there are better controls and reports. But at the core, today’s social listening is the same as social listening in 2011. But we simply need to look harder to find more and more customer comments, especially the negative ones (because they are actually way more valuable). I’m glad Geofeedia is banging the drum for location-based listening, and I hope more and more players in the social media software game start to embrace the concept.